I took a couple of weeks off from blogging, but that doesn't mean that I stopped reading with my daughter. Over the past couple of weeks, these books have been the most requested at bedtime. Karen Katz has been a long-time favorite of my daughter's, and this is no exception. This is a touch and feel board book featuring little ballerinas dressed in different costumes from a bunny rabbit to a cowgirl. My daughter loves to feel the different textures on each spread and especially loves to comment on one of the dancer's pink cowgirl boots. This was a favorite a few months ago that my daughter recently started wanting to read again. This is one of the rare rhyming picture books that really works. If you're not familiar with it, it's about a little llama who's going to bed and gets upset because his mama doesn't come to him fast enough when he calls. It's very cute. I picked up this book when it was first published because I absolutely loved the unique illustrations and the furry black cat named Splat. In this story, Splat is nervous about going to his first day of cat school, but with the help of his pet mouse Seymour, he manages not only to have a wonderful day but to also change his teacher's and classmates' opinions about mice. My daughter loves to look for Seymour in the pages, and I definitely need to get the other two Splat books. What are your kids reading? Leave your link in Mister Linky below or tell me in the comments! There are about a gazillion alphabet books out there. In fact, a recent post at Editorial Anonymous titled "Death by Alphabet Books" goes as far to proclaim that most children don't learn the alphabet from a book, but by good old pen and paper. I tend to agree, and I do think that there are too many out there that just don't work. However, although not perfect, I do like Todd H. Doodler's The Zoo I Drew, and let me tell you why. 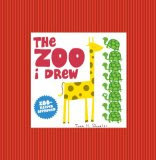 The book is supposedly from the point of view of a two year old who visits the zoo with his/her parents and draws pictures of the animal he/she sees. The colorful illustrations are not pretentious or overdone. It's obvious that an adult drew them, but you COULD believe that a very talented child (definitely not a two-year old though) drew them. I also like the fact that my own two-year old can recognize most of the animals in the book. In an attempt to be unique, a lot of alphabet books feature obscure animals, and while I'm a fan of introducing kids to new vocabulary, I do think that there needs to be a bit of familiarity with the content, or they won't want to read it again, especially younger children. I also love the fact that there is no replacement for X in the alphabet like an Ox or a Xylophone. Instead, the book says, "I couldn't find an animal for X, so instead I grabbed a quick snack. When I returned, I went looking for Y, and that's when I found the Yak." Finally, the fluted (ridged) cover provides a nice and unique texture for young hands. So, here's why it's not perfect. The book presents some basic, yet interesting facts about the animals featured, but most of the rhymes just do not work. I admittedly have a disdain for rhyming picture books because there are very few that actually work and flow well enough to read aloud without stumbling. Take this one about the newt for instance, "The newt is small and slimy, it's a type of salamander. It lives on the forest floor, where it's easier to meander." This leads me to my next point...can you imagine a two-year-old saying this? Not at all, so why is the book told from the point of view of a two-year-old? Why not an older child? But here's the real test. My two-year-old LOVES this book and asks me to read it again and again. She enjoys the illustrations and feels so proud when she can identify the animals. It would definitely have worked better if it didn't try to rhyme, but if you have a higher tolerance for icky rhyming than me, check it out. * Book 7: Harry Potter and the Deathly Hallows! Congratulations! I'll be sending you an email shortly to get your mailing address. Imagine living in a world where you constantly hear the moans of zombies, the Unconsecrated, who are constantly scratching at the walls and gates that surround and protect the village where you live. A world where you've been told since you were born that you are the last humans alive and that it's every woman's duty to marry and have children. A world where you live in constant fear of the Unconsecrated getting through the gates and biting you, turning you into one of them. A world where you've heard stories about impossible things like the ocean and skyscrapers--of a time before "the Return" when there were no zombies and everyone was free from fear. This is Mary's world in The Forest of Hands and Teeth. She's grown up hearing her mother's stories about the ocean and longing to see it even though most everyone laughs the impossibility of the existence of such a huge body of water. She's also not sure her village is the only one in existence, but she seems destined to marry someone she doesn't love or join the strict Sisterhood that governs the village. When the unthinkable happens, she and friends must flee for their lives, and she's determined to find the ocean and evidence of other life once and for all. I read this book in one sitting, and it drew me in from the very beginning and held me captive until the very end. Ryan's description of the zombies was chilling, and I could hear them moaning and scratching. But this is more than a post-apocalyptic zombie story. It's a love story. Mary is betrothed to the brother of the guy she really loves, Travis, and we see their relationship develop and their struggle to be together throughout the book. Mary is a character that I think many teen readers, especially girls, will like, but I think this is the kind of book that will appeal to boy readers as well. Highly recommended. Welcome to another week of What My Children Are Reading. I apologize for missing last week. It was one of those weeks, but this week I'd like to share some Mo Willems books my daughter and I are reading. When my daughter was first born, I went a little crazy with buying books for her. Then I had to make myself only buy books that we absolutely loved. Well, Mo Willems' Elephant Gerald and Piggie are books we absolutely love, and we just added three new ones to our in-home library. Elephants Cannot Dance! is the newest book in the series, just released in June. In this book, Piggie is clad in a tutu and tries to teach Gerald how to dance. As is common with this series of books, Gerald teaches Piggie an important lesson about things not always having to be perfect. I'm consistently amazed at how Mo Willems continues to keep these books simple, funny, kid- AND parent-friendly, and fresh. Are You Ready to Play Outside? and Watch Me Throw the Ball! were both books that we checked out from the library over and over again, so I decided to buy these two as well to add to our collection. We've read each of these nightly since I bought them over the weekend. What are your kids reading this week? Leave your link in Mister Linky or your comment in the post below. 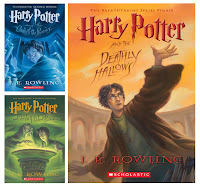 Just a reminder that my contest to win paperback copies of books 5, 6, and 7 in the Harry Potter series ends July 10th. Visit this post to enter!